Happy Spring! And happy spring break to me. The weather keeps being tricky...it will snow in the morning and all melt by the afternoon. Rain in the morning and sunshine at dinner. I don't mind–I'm ready for a change. I have this weird pocket of free time before I leave, so naturally, I did some baking. 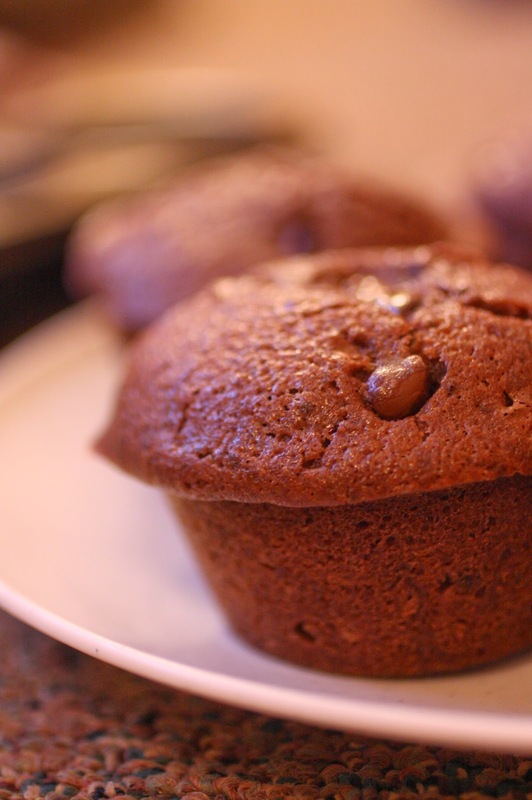 These may look like a typical chocolate muffin, but they are actually leavened with yeast! I'm not sure what exactly to compare them to. A fluffy cake? But they get denser as they cool, and have slightly crunchy edges. Flourless chocolate cake? Not nearly that rich. Hm. I guess I'll have to be content with not being able to categorize them. Have a great week, everyone! I'll be back in a bit. Alternately, for more flavor, you can use 9 ounces of active and bubbly sourdough starter. First make the sponge. Whisk the flour, yeast and sugar together in a medium bowl. Stir in the water, cover the bowl with plastic wrap and leave in a warm place to rise until bubbly. About half an hour. Meanwhile melt the butter in the microwave or in a small saucepan and let it cool. Preheat your oven to 350 degrees Fahrenheit and place a rack in the middle of your oven. Lightly butter a muffin tin. In a large bowl sift the sugar, flour and cocoa powder together. Make a well in the center and add the butter, eggs and yeast mixture. Whisk the wet ingredients together, gradually drawing in the dry ingredients until they’re all incorporated. Lastly stir in the chocolate. Spoon or pipe the batter into the tin, filling the forms to the rim. Bake them for 15 to 18 minutes until almost firm to the touch. While they’re still warm sift on a dusting of cocoa powder.